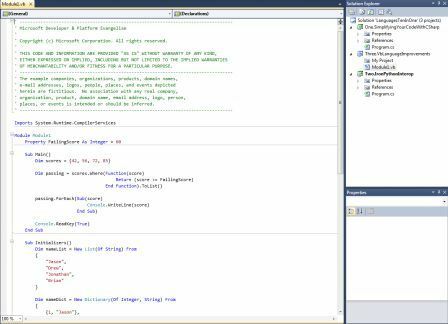 Visual Studio 2010 Express is a set of free tools from Visual Studio product line which offers new integrated development environment, a new editor built in Windows Presentation Foundation (WPF) and support for the new .NET Framework 4 for non-professional developers like hobbyists, students and novice developers who want to build dynamic Windows applications, Web sites, and Web services. In essence, Visual Studio 2010 Express is the lightweight version of Visual Studio 2010. Visual Web Developer 2010 Express – environment for dynamic Web application development. Visual Basic 2010 Express – learning to program on Microsoft Windows. 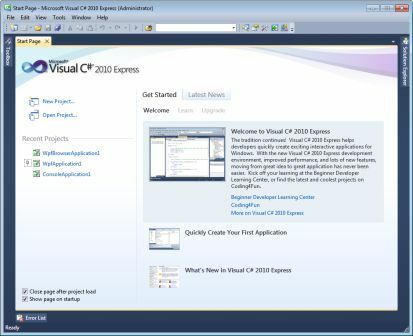 Visual C# 2010 Express – for Windows developers building on .NET. other Visual Studio Express productions. Supports the new .NET Framework 4. Have multi-monitor support as well as part of the new IDE. New streamlined user experience that focuses on the most common commands by hiding some of the more advanced menus and toolbars. These are easily accessible by users via the Tools / Settings menu. Visual Studio 2010 Express missing quite a bit of features such as MFC or ATL, and lacks Windows GUI libraries and includes files. It means that users probably can’t develop Windows GUI application using the Express edition. Visual Studio 2010 Express is free forever, and there are no licensing restrictions for applications built using Visual Studio Express Editions. Visual Studio 2010 Express is available for free download from http://www.microsoft.com/express/Downloads/ as individual app separate downloads. Users can choose to install via web installer, download standalone offline ISO image file, or Microsoft Web Platform Installer 2.0, which download, install and configure your computer for building Web and Silverlight applications, which includes: Visual Web Developer, SQL Server Express, Silverlight Tools and ASP.NET Extentions. Note that if you have a MSDN subscription, or is a student or in academic profession, or small developers, DreamSpark, WebsiteSpark or BizSpark can allow you to download and install Visual Studio 2010 for free, legally without costs. After installing, the programs of Visual Studio 2010 Express will state “For Evaluation Purposes Only”, which run for 30 days. Registration is required to continue using Visual Studio 2010 Express. Registration is free and comes with access to additional benefits. Once activated, the Visual Studio 2010 Express will no longer has the warning message, and lasts forever.